What’s Safe to Update on my Computer? A lot of problems on the computers I get called out to repair are caused by a virus, malware or other such undesirables. Most PC owners ask me, “How did I get that? I’ve got an Anti Virus program, shouldn’t that have stopped it?” Well, the truth is, you probably gave the virus permission to infect your computer! Of course, you didn’t know you were freely inviting this cyber vandal to mess with your data, but that’s what you did, and this is probably how it happened. Imagine the scene, you are browsing the internet and you visit a website, maybe a very legitimate site and all of a sudden you see a message like the one below pop up in the bottom right of your screen. Scary, isn’t it? Well, this is a hoax. The site you visited is infected and if you click Yes or click the lower warning, you’re probably going to allow a virus to be installed on your computer. Even clicking the red X to close the box might do the same thing. What you must do is close your browser or switch off your machine and reboot. If you do that then you’re probably safe. I’d advise running a scan using your regular Anti Virus Program (Norton, AVG, McAfee, Avast, Kaspersky etc) just to be sure. So I’m not surprised that some people don’t like clicking ANY message that pops up on the bottom right of their PC. The problem is, 99 times out of a 100 it’s perfectly safe to do and indeed I strongly advise you to follow the instructions. Java is an essential program that runs in the background and should definitely be updated when a prompt like this appears. 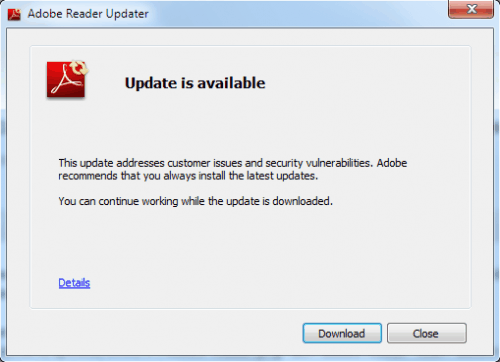 Another important one, Adobe Reader should also be kept up to date. These are the most important ones, that little yellow shield belongs to Microsoft Windows Update and it’s vital to keep your operating system up to date. The first image is what you’ll see if you’re using Windows XP and the lower image is how the same message is displayed with Vista and Windows 7 . You will also get messages from your Anti Virus program. You must learn to recognise these messages. Some programs will display pop up messages a few times a day purely for information and most of the time they don’t require any action from you. But what’s with all these updates, you may be asking? 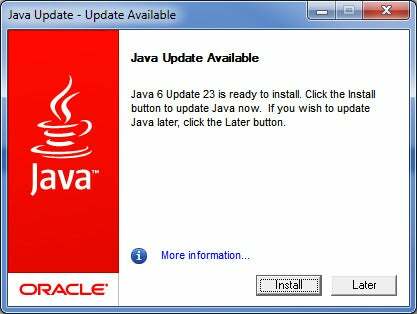 Most of the updates are security patches, designed to stop the idiot hackers from exploiting vulnerabilities in software. So updates are a necessary inconvenience, I’m afraid. Remember, if you’re in any doubt, give me a call and describe the message you’ve received and I should be able to tell you to update or not. Posted in antivirus, general help, tutorial. Great advice Peter, spot-on! I fix computers too and see more and more of this. It’s amazing how many people either click this stuff and spread the virus throughout their computer or won’t click anything and miss important updates. You give very sound advice! Great blog!